Father’s Day | amen and ehmen! I sit and stare at the photograph. Like my memories, it is faded. I just don’t seem to remember much. Black and white, shades of gray memories. I know you once existed in physical form, but, unfortunately, our life together was way too short; pretty much just a foreword and preface to my own story. Sometimes I wonder if I have blocked memories of my childhood, just because your untimely departure hurt so much. Because I know if I remember the good times then I will also have to remember how those good times ended. Those were dark days, even for an 8-year old whose most pressing decision was whether or not to climb the tree in the backyard. One day you were there and the next you were gone. And even though my present mind sees our days together as a mere outline, like the beginning of a sketch without the details filled in, today, on this Father’s Day, I sit here and FEEL a flood of memories. I FEEL your warmth as we cuddled up on the couch and watched Elvis movies AFTER my bedtime. I FEEL your strength when you’d catch me as I leaped into your arms when you came home from work. Please forgive me if I ever hugged your neck too tight as I searched for that ever-present piece of gum in the pocket of your starched white shirt. I FEEL your gentleness and compassion as—after being banished to my room to “just wait until your father gets home—you arrived to lovingly correct me and, with the fluffy wallop of a pillow, forgave me of my transgressions. I FEEL the pride I felt when I was up at “daddy’s work.” Yes, that was me that was always rummaging in your desk drawers for change for the coke and snack machines, and no, I still do NOT want a piece of the fruitcake you sold for the Civitan Club. I FEEL thankful for all the family times, the vacations in Clearwater, Florida at the Sandlewood Hotel, the holidays, the dinners around the dining room table and all the moments for the eight years that we were together. For though I don’t remember many of the details, I DO remember the FEELINGs of LOVE—feelings powerful enough to help me navigate through your most devastating and tragic departure; through the difficult years that followed as we tried to put our lives back together; through the many years and many milestones that would have been so much more with you here; all the way through today as I spend this Father’s Day weekend feeling memories made more than four decades ago; memories that turned into a life time of love. 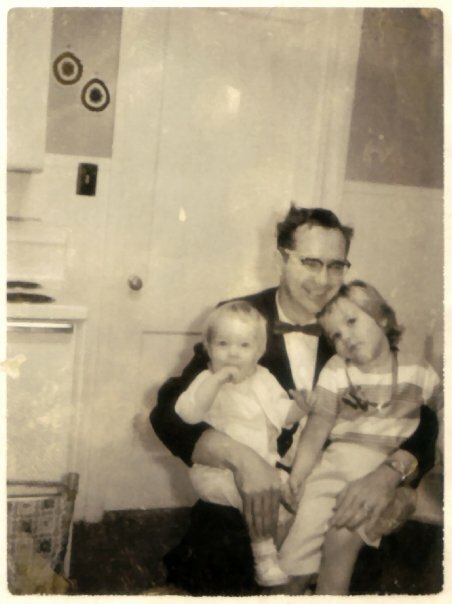 Thank you, God, for my earthly dad and for this walk down memory lane. But, most of all, God, I thank you for YOU and for your promise that one day my stroll down Memory Lane will bring me to Heaven’s Gate where I will once again have the chance to jump into my Daddy’s arms. Make sure you have Juicy Fruit. It was always my favorite. Happy Father’s Day to you both. Amen and Ehmen!